With Newton’s customizable online job applications, employers collect the right info, maintain compliance, & ensure good candidate experience. Control your hiring process by creating mobile-friendly online job applications available in English or Spanish, vastly improving the candidate experience. Attract more qualified candidates to submit online job applications with a modern candidate experience. Our advanced document parsing engine will automatically fill out online job applications in real-time when job seekers upload a resume from any mobile device or desktop, dramatically improving the applicants’ job seeking experience. 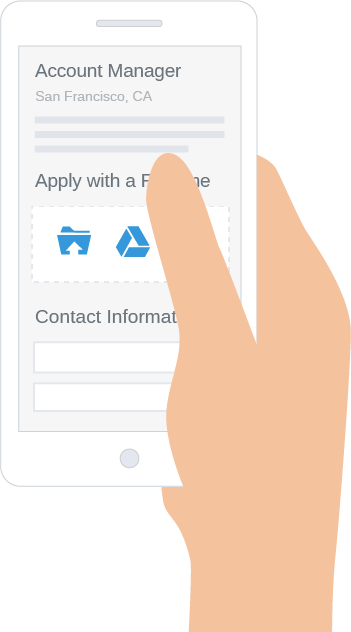 Required fields guarantee that you are safely collecting the correct information from every applicant that you can use to send confirmation emails, thank you emails, rejection emails, offer emails, and any other communication you might have with a candidate. Whether you’re a mid-market manufacturing company or in the healthcare business, it’s inevitable that job seekers want to access your careers website and apply to online job posts from smartphones and tablets. This means using Newton’s Cloud Apply is essential to allow candidates to submit resumes and other files via cloud-based storage services like Google Drive and Dropbox. Cloud Apply used in conjunction with our resume parsing engine means higher candidate conversion rates, a win-win for you and candidates. Seamlessly post job openings in English or Spanish opening the doors to 13% more of the United States population. 52.6 million Americans speak Spanish as their native or secondary language and with multi-language capabilities, candidates can go through every step of the application process in either language. Use minimum qualification questions and employment applications together to ensure your team is reviewing the right applicants. Employers have the flexibility to customize the online application process to meet their needs and ensure EEO / OFCCP compliance. With Newton, you’ll capture answers to voluntary EEO/ AA surveys consistency while automatically building your applicant flow logs and hire offer log.